Summer, and swimsuit season, is right around the corner. Is it too late to do something effective? The good news is six weeks is a decent amount of time to make a difference. Follow this six-week timeline and these fitness tips to help you get beach ready fast. To be successful at any new venture, exercise and weight loss included, you must make a plan. A dream without a plan is just a wish. Before you even decide on which kinds of exercises you should do, make sure you find a routine you can stick to. Whether you need to get a workout buddy, prefer the gym, or set up a workout area in your home, the main factor in your success will be consistency. If you can’t stick with a routine, you will fail at whatever exercise you choose to do. Emphasize both cardio and some sort of resistance training, with light weights or exercise bands. Take an honest look at your fitness level and the amount of weight you want to lose. A safe rule of thumb is losing one to two pounds per week. Don’t go all-in for your first couple of workouts. Pace yourself or you’ll end up too sore to continue and set yourself up for failure right out of the gates. Also, don’t focus solely on exercise. You need a two-pronged approach of diet and exercise to see real changes. Let’s face it, effort with nothing to show for it is pretty discouraging. Set yourself up for success with early results. Start cutting back on things like bread and white rice in the first couple of weeks to save calories, aiming for one serving a day. Also start to reduce the number of days per week you eat lunch out. Bagging your lunch will help you control choices and calories. Once you’ve created a routine and you’ve been following it for a couple of weeks, your chances of success increase. Now all you have to do is stay the course and keep doing what you’ve been doing! Continue to aim for exercise three days per week combining both cardio and strength training. Also continue to focus on eating the most nutrient rich foods with the fewest calories, such as vegetables and low-fat proteins (lean chicken, eggs, fish, tofu and protein powder), with moderate to low consumption of fruits and grains. Hopefully, by now you’re starting to see some changes in your body and on the scale. Use those changes to fuel your resolve. Continue making smart food choices. Make sure to include some protein at every meal and snack to avoid between-meal binges. Make smart food swaps whenever possible, like skim milk instead of whole in your coffee, and oil and vinegar salad dressing instead of creamy options like ranch and Russian. You’re on a roll now! Kick in the afterburners. Consider swapping a protein shake with low-fat milk or almond milk for one or two meals each day, then have a balanced meal of vegetables and low-fat protein for your third meal – like steamed broccoli and salmon or chicken breast. Also, use this remaining time to beat bloat by avoiding sodium, alcohol and carbonated drinks. Let your progress power your decisions! Time for fun in the sun while feeling confident and proud of the steps you took to become a slimmer you. If you didn’t quite reach your goals…keep going and build on the success you’ve had. You have the whole summer ahead of you, so use it to your advantage. NOTE: If you’re eating right and exercising regularly, and still notice stubborn fat deposits in specific areas like the tummy, hips, or waist, SculpSure® may an option for you. 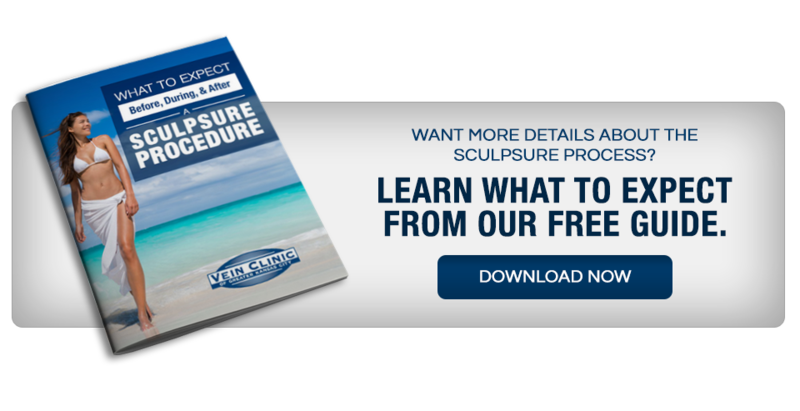 SculpSure® is a laser-based FDA cleared treatment to reduce the amount of fat cells in a specific area that is resistant to diet and exercise. SculpSure® works by raising the temperature of body fat in problem areas, with no surgery, downtime, or bruising of surrounding skin. And, according to clinical testing, results can be seen in as few as six weeks. To learn more about SculpSure®, call the Vein Clinic of Kansas City at (913) 541-3377 or contact us online. We’ll be happy to answer all of your questions. This entry was posted in Aesthetics by Dr. Craig Barbieri. Bookmark the permalink.